Kimmy "We had Ryan for the Thai island hopper tour and he was absolutely fantastic. He had very clear instructions on meeting points, always making sure everyone had a mode of transport sorted and a map if needed so no one got left behind. Never ran out of games to play on the quieter moments of the trip to keep everyone happy and laughing. He's very knowledgable on the histories of the places we visited..."
Relax on a ferry ride to glorious Koh Phi Phi. Dance all night on the beach at Koh Lanta. 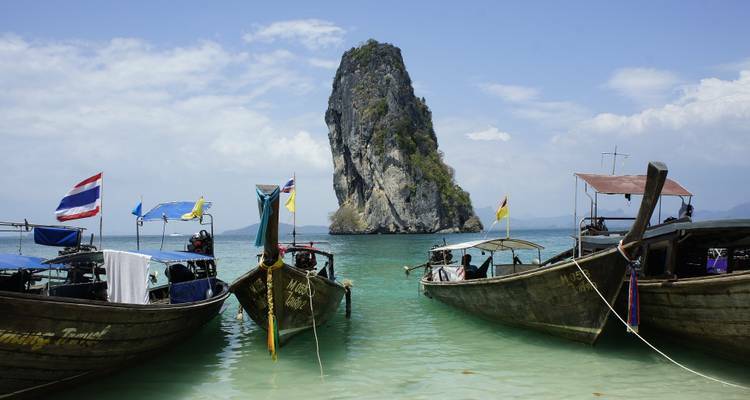 Glide through Thailand's tranquil crystal clear waters. 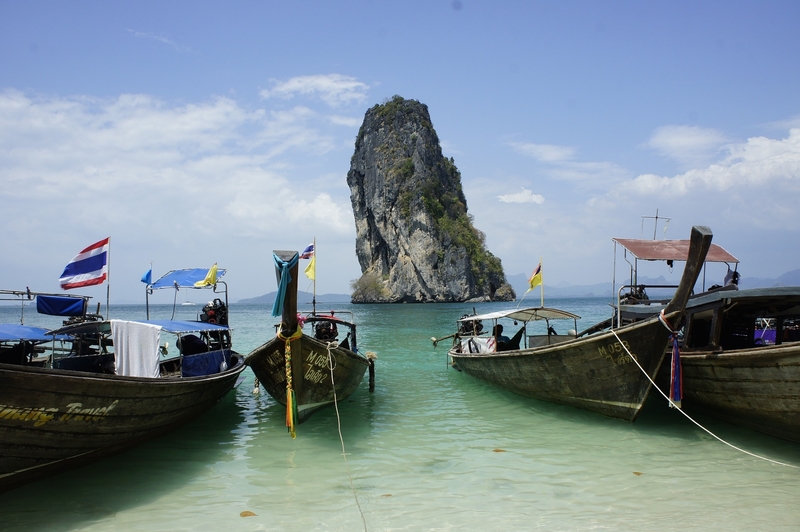 Lap up the limestone karst scenery at Railay Beach. Start and end in Phuket! With the adventure tour Thai Island Flexi Hopper, you have a 9 day tour package taking you through Phuket, Thailand and 3 other destinations in Thailand. Thai Island Flexi Hopper includes an expert guide, meals, transport and more. Lauren was fantastic, her knowledge of Thailand was interesting and informative. Always there to offer advice and guidance. Thoroughly enjoyed the whole experience. How can you book your accommodation? Once you have booked your tour, you can log into your MyTrip account and book into the recommended accommodation; this is where Busabout will drop you off and where most of your fellow travellers will decide to stay. Busabout's trips are geared towards young independent backpackers, and generally attract an age range of around 18 - 30. This is just a guide, however, and there are no upper age limits for this tour. As long as you share their spirit of travel you’ll be fine! Are transfers included from the airport and ferry ports? Transfers to and from the airport are not included, however transfers are included from the hostels to the ferry ports. "Pinkie, Lubi, Lauren! Get ready for a story! Because I'm a storyteller!" "I love seeking new adventures, traveling is constant fun. Guiding is the best job I have ever had so..."
Start and end in Phuket. TourRadar only requires a deposit of $99 to confirm this Busabout booking. The remaining balance is then payable 50 days prior to the departure date. For any tour departing before 8 June 2019 the full payment of $414 is necessary. No additional cancellation fees! You can cancel the tour up to 50 days prior to the departure date and you will not need to pay the full amount of $414 for Thai Island Flexi Hopper, but the deposit of $99 is non-refundable. Covering a total distance of approx 188 km.